Residents will soon be able to use their Emirates ID cards as health insurance cards, a move that will reduce fraud and misuse of medical insurance services according to the officials. A private health services firm said it had started the service for 3,000 of its members three months ago even before the first official announcement in this regard was made by the Dubai Health Authority (DHA) last week when it launched Saada, an insurance programme for Emiratis. Officials at the launch had said that to offer comprehensive mandatory preventive care programme, the Emirates ID card will be used instead of a conventional insurance card. “This is the way forward,” said a senior official from DHA referring to the replacement of the insurance cards with ID cards. Dr Haidar Al Yousuf, director of health funding at DHA, said a detailed announcement will be made in this regard soon. “Combining these services in one card is hassle free and highly convenient for users,” he said. According to Laila Al Jassmi, Board Member of Iris Health Services that is currently offering this service to its members in Dubai and the Northern Emirates, the identity authority has already provided card readers to almost 45 providers — hospitals, clinics and pharmacies. The readers enable service providers to scan insured members’ Emirates ID cards and access their policy details. “The card is used by the network as per the insurance plan taken by the patient,” said Laila. The Emirates ID card, helps in minimising fraud and misuse of medical insurance services, she said adding that the integrated system means people do not need to carry several cards. 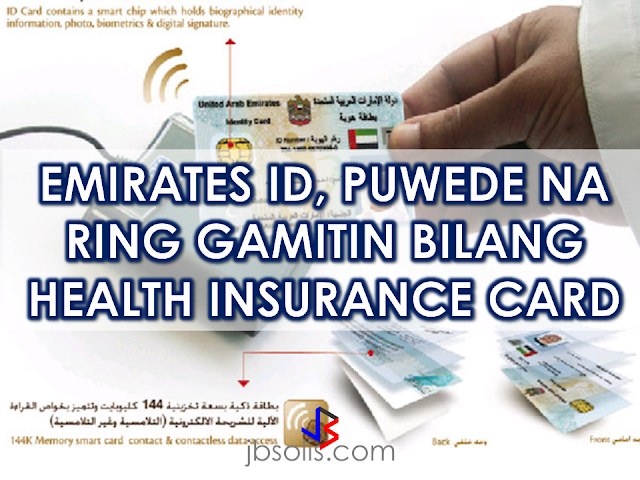 Currently, a patient has to present an Emirates ID card along with the insurance card while availing any service. Now, to avail of the health service you only need to present your Emirates ID. “By using the card as the method of identification and verification of the insured member, we are able to maintain the member’s electronic medical record across medical service providers allowing the patient’s treating physician to access all previous treatment details and history,” Iris Health Services, Chief Executive Officer Anil Nair said. trainings are being conducted to Medical professionals by the company to familiarize them to the new system. In case that the Emirates ID card expires,the company will be issuing a certificate enabling access to health care up to 60 days .